This article appeared in the Evening Record on May 9, 1931. 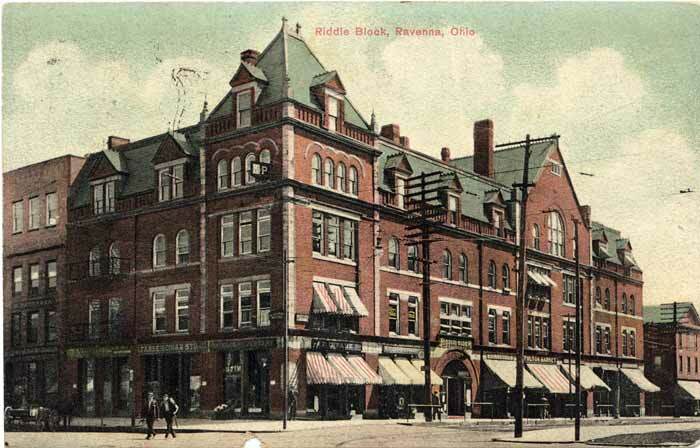 The picture is an old postcard from our archives. Writer Recalls Blaze That Destroyed Old Exchange Building at Main and Chestnut St. When fire swept the old Exchange building at the southeast corner of Main and S. Chestnut Street in 1887 it removed one of the oldest landmarks in Ravenna. The building was one of the antiques from semi-wilderness days and had long been outlawed in the court of community standards. But the higher court of profitable returns reversed the judgment and continued to protect the ancient eyesore until its own decree was overthrown by the unanswerable brief filed in the court of unquenchable flames. Then H. W. Riddle, Ravenna's greatest builder, took control of the situation by purchasing the site of the historic tavern and that of several shacks adjoining it on the south which also disappeared in the general conflagration. It was not long before he had a large force of men clearing away the debris and getting the ground ready for the foundation of Riddle block number 1, which was erected in 1888. Those who never saw the sorry looking relic and its setting of scrubs and scarecrows can have but limited appreciation of the improvement made and of its transforming effect in the uptown district by the erection of such a four-story structure. It was Mr. Riddle's purpose to give visitors a better impression of the town by improving and modernizing its commercial center, and he carried out the plan in accordance with his vision and his faith in the future. He loved Ravenna and it is a tribute to the sincerity of his devotion to record the fact that instead of taking his money out of town, he invested the bulk of it at home in erecting a dozen business blocks, nearly all of which displaced buildings offensive to the eye, in building, homes and in equipping the community with many smaller shops for lesser retail purposes. "Uncle Henry" was on the spot to accommodate those wanting anything from a home to factory. It was he who erected the three story building for the Loudin shoe factory and gave the company its use rent free for a liberal period of time. He left many monuments of executed purpose in the community which he helped to develop along larger and more modern lines. Returning to the "Old Exchange," it is recorded that the building was erected in 1809-10 by "David Grier. When "William Tappan laid out the town in 1808, he gave to David Grier the southeast corner lot fronting the public square, on condition that he should build a tavern thereon. He accepted, the gift, and forthwith began the erection of a public inn fashioned after the approved models of the day. It was a wilderness wonder and immediately became a center of hospitality for the ever increasing company of newcomers looking for business, professional or mechanical openings. Grier was its first landlord and directed its service until he sold the place in after years and built the famous Black Horse tavern, a quarter mile west of the village. His successor was William King, after whom came a long line of landlords, the first of whom was his son, Robert King. Sam Sutliff was the next, followed by John Birtley King and Eli P. King, both sons of William King, and L. P. King, a relative of the other Kings. During these years the place was popularly known as "King's Tavern" and did a thriving business. It then passed into the hands of a Mr. Hanscombe. It was here that Hiram Collins of local hotel fame began his career. In 1845 William Ward came to Ravenna and began his busy life at the county seat, and in the course of time became proprietor of the widely known hotel, still known as "King's Tavern." He was afterward proprietor of a tavern that stood on the site of the present Opera block, erected by C. A. and G. P. Reed. Following him the tavern, which came to be known as the Exchange Hotel, was successively in the hands of J, H. Stoop, T. H. Beckwith, D. K. Wheeler, who came from Wheeler's Corner in Randolph township; Hiram Adams, H. Ewell, R. I. Mason, C. W. Mason, landlords Davis and Judson. Then came Timothy Taylor' and Simon Stough, two noted hotel men of their day. The place was sometimes known as the Taylor House and the Stough House under their respective regimes. Simon Stough was the last landlord of the old time hostelry. Following its long period of service as a public inn, the property was sold to the Etna Block Company in 1873, following which it was used for a variety of purposes until its final chapter was written in letters of fire. Mr. Riddle then purchased the land between Main St. and East Maple Alley, on which he erected Riddle block No. 1, thereby transforming the corner from one of an unsightly lot of old and out of date buildings to one of urban attractiveness. That was the beginning of a series of notable improvements for which the city is indebted to the man who came to Ravenna without money or commercial backing and built up one of the largest carriage coach and funeral car manufactories of its day, known in all sections of the country. "Uncle Henry" made his fortune right here in Ravenna, and here is where he invested his money.